Scotto Mycklebust was born in Minneapolis, MN, in 1954. He studied art and humanities at the University of Minnesota, and obtained degrees in Studio Arts, Visual Communications and Theater Set Design from Augsburg College. Mycklebust has long been a versatile and pioneering force in multimedia art; his practice encompasses painting, drawing, sculpture, sound, video, and performance. His work scrutinizes contemporary attitudes towards imperialism, commerce, globalization, and the body, challenging dominant ideologies and conventional aesthetics. He has described his body of work as an "expanding vision," which allows him to "speak in many voices" while exploring persistent themes. "Over time it has become very clear to me that the medium is just a vehicle," he says. "I find that limiting yourself as an artist or staying within one particular field of art just does not cut it these days. As economic systems globalize and the media landscape becomes more complex, it's important to expand your practice. Multitasking is part of our nature today." After graduating from Augsburg, Mycklebust worked briefly as a graphic artist for a trade show company, where he learned to juggle multiple projects and styles. Soon, he established himself as an independent artist. His earliest works were mostly paintings, which synthesized elements of pop art and analytical cubism. 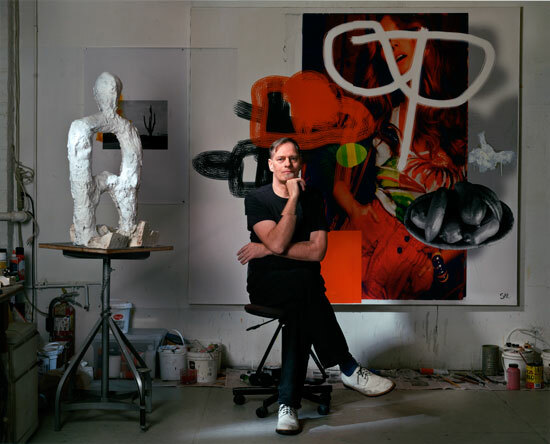 In the early 1980s he accepted a position at the Walker Center for the Arts in Minneapolis, where he worked with Robert Wilson, John Cage, Laurie Anderson, and Philip Glass. Inspired in part by these adventurous artists, he began to undertake his own experimental projects, which were innovative in their blending of genres and styles. These early multimedia pieces included Frankenstein & Gaea: A High-Tech Tribal Opera (1982) and Metallic Dog Ballet (1982). In 1984 he collaborated with a choreographer and a computer programmer to create Borderlands: Augmented Transformations of Real and Recorded Time, a landmark work of synaesthesia that integrated music, video, and dance. For over twenty-five years, Mycklebust has continued to explore a wide range of media. While many conceptual artists are more interested in ideas than execution, Mycklebust's art exhibits not only theoretical rigor but also technical skill. Recent paintings, such as A Marat Painting (2008), WAR No (2007), and We Will Not Be Silent (2007) draw on a range of contemporary and historical images, demonstrating a deep engagement with both traditional European portraiture and the 20th century avant-garde. He has been quick to incorporate digital technologies into his work, and several of his compositions combine computer-generated imagery with oil paint. Mycklebust has also continued to compose music, using sophisticated computer programs and his primary instrument, the piano. After the events of September 11th, 2001, Mycklebust's art has become increasingly political, reflecting a well-founded anxiety about America's muscular foreign policy. Influenced by the provocative opus of Martin Kippenberger, new works such as Big Money Bag Sculpture (2006) and I Am Not a Terrorist (2008) confront the paranoia, corruption, and grotesque violence of the post-9/11 world. With Public Art Squad (2004) Mycklebust reached beyond the world of studios, museums, and galleries, introducing performance art into the public space. Political Machine (2008), a sound and video piece about the possible Iran War, was included in "Sonic Self 2," a group show at the Chelsea Arts Museum. Rev (2003), an installation piece that simulated the horror of the Iraq War, was included in "Sonic Self at the Chelsea Art Museum. In 2009, Mycklebust moved his art studio to the West Chelsea Arts Building, located in the center of the West Chelsea gallery district. The move inspired new direction in his work, to explore a new mix of traditional art making techniques with digital techniques and technology. A new series of large-scale Super Size paintings were born. The moved to West Chelsea also brought on the involvement with the West Chelsea artists’ community. Since 2010 Mycklebust has organized, programmed and produced, over twenty annual artists open studios event: including the High Line Artists Open Studios, www.highlineopenstudios.org and the West Chelsea Artists Open Studios, www.westchelseaartists.com. In 2011 Mycklebust created and published Revolt Magazine, a print tabloid and online art commentary publication with international distribution. 2012 included a trip to Berlin for Revolt Magazine and participation the 7th Berlin Biennale Occupy Museum Movement. Mycklebust has become an artist’s advocate and activist for New York City’s West Chelsea artists’ community and the Arts, helping artists develop and grow as an independent artist. Mycklebust recent projects include a new online publication: ART511 Magazine, www.art511magazine.com and a boutique West Chelsea gallery district POP UP gallery space for visiting artists to present their work in the New York City. In 2017 Mycklebust will launch New York Music Art Project, www.newyorkmusicart.com a studio based performance space for intimate performances of new music art.